British singer Adele has won two prizes at the Brit Awards ceremony in London, but was at the centre of controversy after one of her acceptance speeches was cut short and she made a rude gesture. 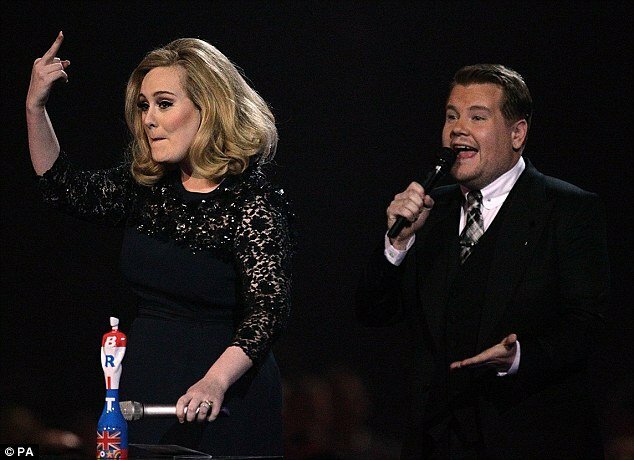 Adele’ speech was interrupted by Brits host James Corden after she picked up the prize for best British album. The singer, who had won the top award of the night, Album of the Year, flipped the middle finger to show just how annoyed she was. “I flung the middle finger. That was for the suits at the Brit Awards, not my fans. I’m sorry if I offended anyone but the suits offended me,” Adele said. Adele also won best British female. Ed Sheeran also won two awards – best British male and British breakthrough. Coldplay were crowned best British group for a record third time, while former X Factor boy band One Direction beat Adele to the award for best British single. Adele added her Brits to the six Grammy Awards she won last weekend, capping a year of huge global success. According to her record label, the London singer’s second album 21 has sold 17 million copies around the world and hit number one in 24 countries. Accepting the best album prize – the final and most prestigious of the night – Adele said: “Nothing makes me prouder than coming home with six Grammys and then coming to the Brits and winning album of the year. But there were boos from the audience as the singer was interrupted by host James Corden in order to introduce the final performers, Blur. Adele’s gesture was then momentarily visible on the live ITV1 coverage. “I was about to thank the British public for all their support but they cut me off,” the star later said backstage. A Brits spokesman added: “We regret this happened and we send our deepest apologies to Adele that her big moment was cut short. Adele’s 21 beat Coldplay’s Mylo Xyloto, Florence & The Machine’s Ceremonials, PJ Harvey’s Let England Shake and Ed Sheeran’s + to the best British album award. In the best British female category, Adele beat Jessie J, Florence & The Machine, Kate Bush and last year’s winner Laura Marling. She also sang Rolling at the Deep at the ceremony – only her second performance since throat surgery last year. Meanwhile, US pop star Bruno Mars was named best international male, Rihanna picked up best international female and the Foo Fighters won best international group. Ed Sheeran led the nominations going into the ceremony, up for best British male, breakthrough, single and album. He beat rapper Professor Green, James Blake, James Morrison and Noel Gallagher to the prize for best British male. Coldplay were crowned best British group in a category voted for by listeners to BBC Radio 2. Frontman Chris Martin described it as “very humbling”. The outstanding contribution honour went to reformed Britpop favourites Blur, who performed a medley of their hits. Their last appearance at the Brit Awards was in 1995, when they went home with four trophies. One Direction won best single for their hit What Makes You Beautiful, beating tracks including Adele’s Someone Like You, Ed Sheeran’s The A Team and Price Tag by Jessie J and BoB. The event also included tributes to the late stars Whitney Houston and Amy Winehouse and featured performances from Noel Gallagher, Florence and the Machine, Rihanna and Olly Murs with Rizzle Kicks. adele's racist statement after the grammy award?